As a kid I played in the street. A lot. I played kickball with the neighborhood kids, I rode my bike, yelled “you’re it” and then ran, and drank from the hose. My own children are making very different memories. 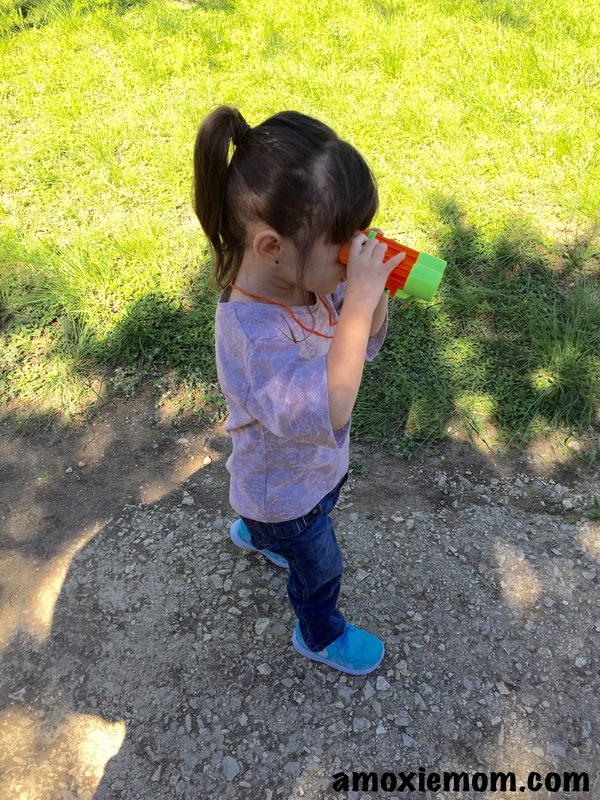 Cars sometimes speed down my street with little regard for children or animals making it nearly impossible to play in, and the idea of drinking water from the water hose would probably confuse them. It’s a different time, I know, but getting them outdoors, among the bugs and the dirt and the trees is important to me. I believe it’s vital for their well-being, and also for the well-being of our planet and their futures. As a child I jumped the fence of my grandparent’s yard to rush over to the nearby park and recreation center. I returned only for lunch, and sometimes not even for that, as it was offered at “the rec.” We’re fortunate to live near one of our city parks, and lately we’ve been spending time exploring it. 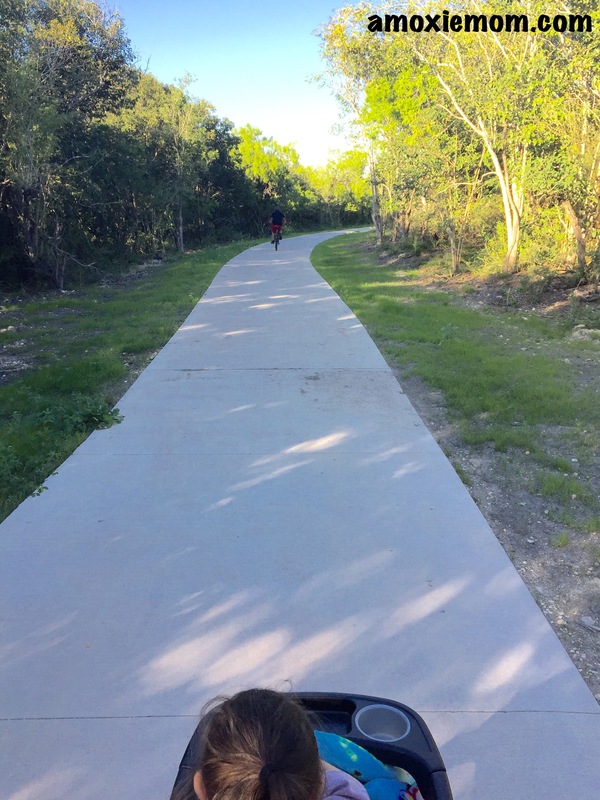 Xander enjoys riding his bike through the green trails, and MJ runs around finding butterflies and ladybugs and rocks (she currently has a fascination with rocks). Sometimes it’s too long a walk and she rides in the stroller, taking in the scenery. Until fairly recently, when I asked the kids if they wanted to go to the park, I meant to go play on the swings and play structure. Now that question has a different meaning. While we’ve become familiar with the parks closest to our home, I know San Antonio has so many other parks to enjoy. I’ve set a goal to start exploring them. The SA Kids Family Nature Club is helping with that. This new group brings local families together the first Sunday of each month to explore a local park. 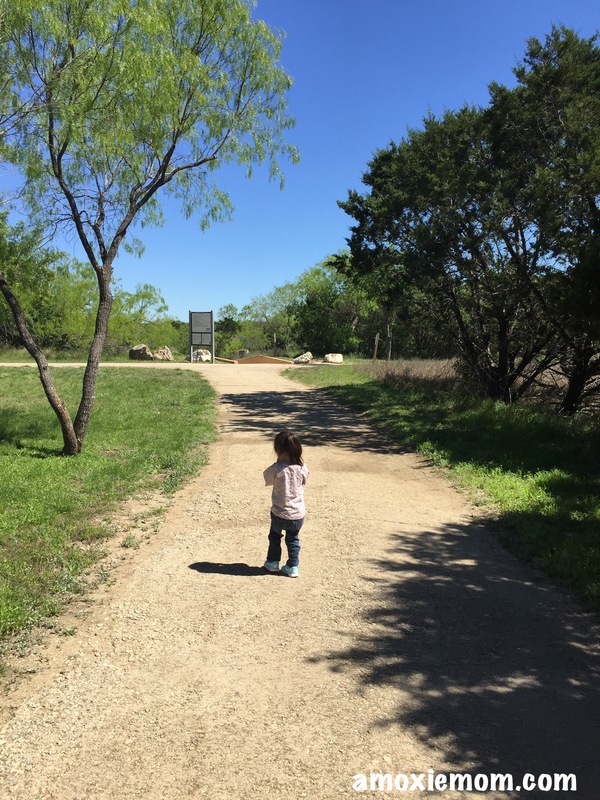 We recently joined the group on its first adventure at Bamberger Nature Park and it was a fun-filled morning for MJ. Several other families with young children walked the trail, observing the creek, trees and bugs. One of the tots shared her binoculars with MJ and she was eager to see things through this different lens. We’re looking forward to joining the group on their next adventure to Olmos Basin Park. As an early childhood teacher I’ve long understood the benefits of recess and outdoor activities, and I have yet to meet a student who didn’t enjoy an activity much more of it took place outdoors. 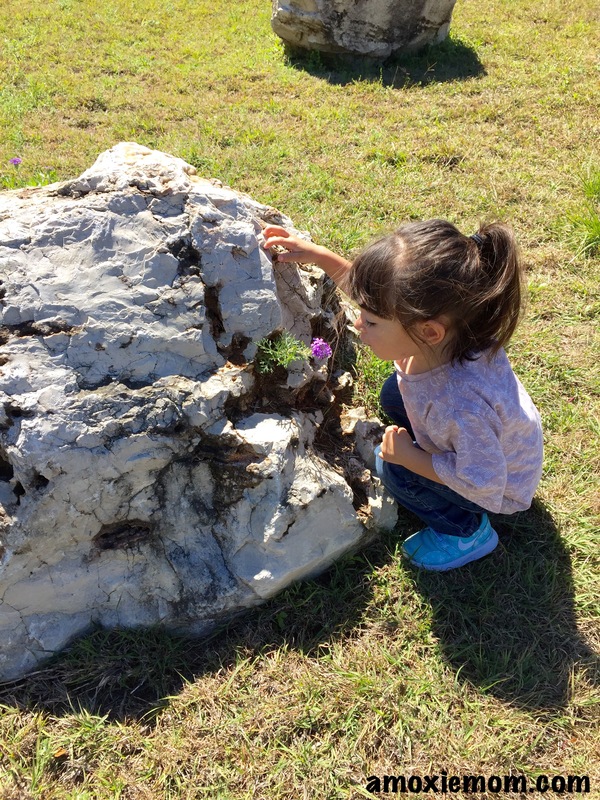 The scientific inquiry, math, language and problem-solving kids learn from the outdoors, along with the obvious health benefits can make anyone question why kids have such limited outsidetime. I’ve accompanied students on countless nature walks, done outdoor yoga barefoot in the grass, read books and ate snacks, and worked on art pieces all outside of the confines of the classroom walls. While my school children have long benefited from outdoor learning, sadly, my biologicals do not always have the same advantages. 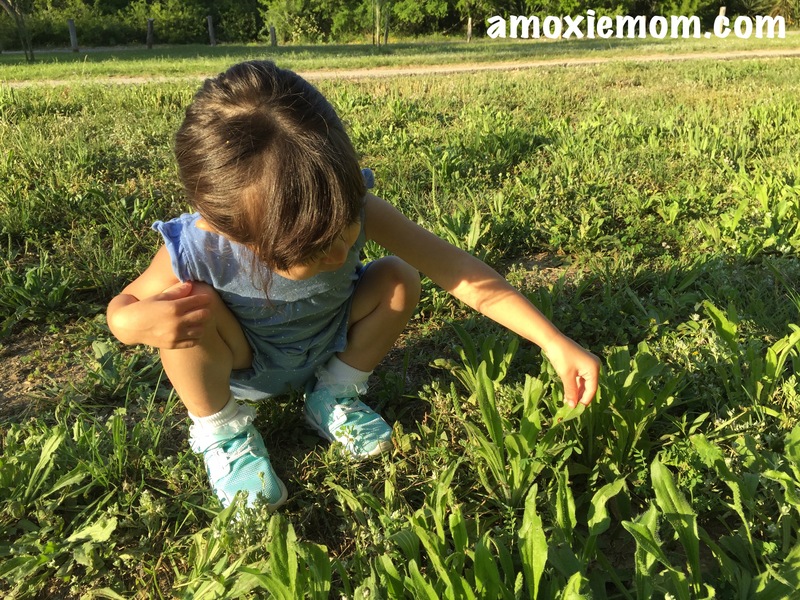 After the long work days, nature walks and art projects sometimes take a backseat to dinner preparations, errands and the daily routines of life (the mother-teacher struggle is real). I fear that MJ and Xander are missing out on some of the crucial life lessons they could be learning about being gentle and kind and conservative. I’m setting a personal goal to make sure my kids become more in tune with nature, and I’m learning that the free parks within my own city are a great starting point. Great post! It is so wonderful that we live in a city with so many great parks and weather that allows for amble time outdoors! Yes! I’m a bit worried about the summer heat that is approaching, but we’ll just have to visit first thing in the mornings.